MARK NANCE/Sun-Gazette Montgomery’s Breanna Segraves beats the tag at home as Muncy catcher Alexis Treese fields the throw on a triple by Faith Persing in the second inning at Muncy on Thursday. MUNCY — Morgan Tupper never watched her grounder roll toward Muncy shortstop Jen Frederick. She just ran. The Montgomery second baseman sprinted like a gazelle and beat Frederick’s throw by a step, producing a two-out single. How important that hustle was became obvious a batter later when Riley Fry launched a long, three-run home run over the left-center field fence, helping Montgomery break open a game against its top rival. A little bit of hustle, a little bit of speed and a little bit of power are making Montgomery look a little dangerous. 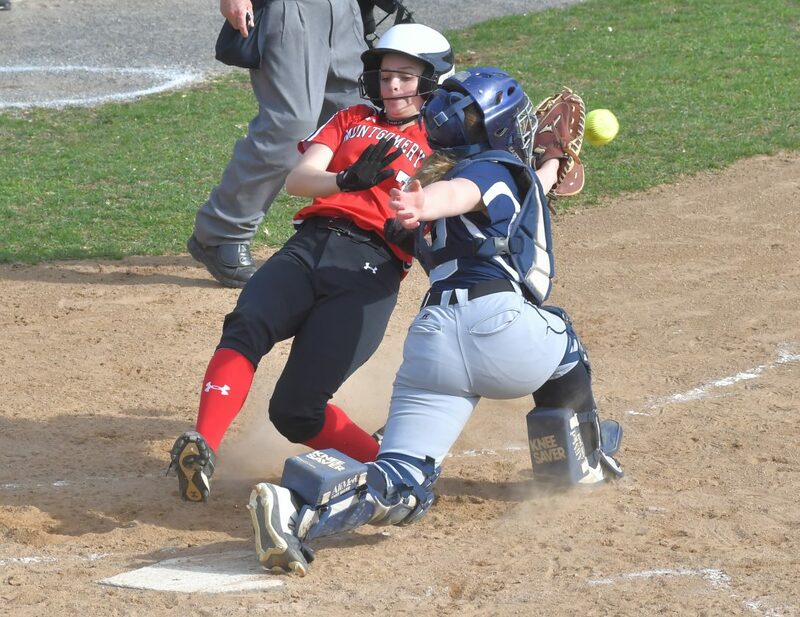 Tupper reached base four times, Fry added two hits, players produced well throughout the lineup and Emily Snyder tossed a four-hitter Thursday as Montgomery defeated Muncy, 13-2. The Red Raiders (3-2, 3-1) delivered 10 hits, scored the first 10 runs and played well in all facets while turning strong practice into excellent execution. Montgomery will be really happy if it keeps building off yesterday’s performance. A team that has just two seniors and that starts five freshmen has scored 46 runs in its three wins. Yesterday, it reached 10 hits for a third time. Tupper turned a potential RBI single into a rally-killing double play, the offense scored multiple runs four times and Snyder struck out nine. A year ago, Montgomery reached the District 4 Class A semifinals, but the difference this season is offensive firepower. The Raiders have no weak spots in the lineup and feature a potent speed/power combination. Four players delivered two hits, Montgomery aggressively ran the bases and Fry’s no-doubt, three-run home run gave it a 10-0 fifth-inning lead. Tupper is helping fuel that offense and continued her torrid start yesterday, going 2 for 2 with two walks, three runs and two stolen bases. Her lead-off single fueled a five-run second-inning rally that included Jenna Waring’s sacrifice fly and RBI singles from Faith Persing (2 for 4) and Brynn McRae (2 for 5). Going back to last year’s district semifinal, Tupper has produced multi-hit performances in five of her last six games. She 4 for 5 in her last two games, driving in three runs and reaching base in seven of her eight at-bats. Tupper again was a catalyst in the third inning, drawing a lead-off walk, stealing second and scoring on Waring’s RBI single. Shelby McRae added an RBI grounder as Montgomery went up 7-0. Muncy (2-3, 2-1) struggled defensively, making four errors, and also was a victim of Montgomery’s defensive prowess. Tupper turned what looked like it would be a Leia Eisenhower RBI single into a double play in the fourth inning, going into the hole near second base, snaring the line drive and tagging second. An inning later, Snyder helped her own cause, stopping a hard-hit Kassidi Lenhart grounder that would have resulted in a two-run single and recording the inning’s final out. Snyder was hard enough to hit, striking out four of the first five batters she faced. Montgomery’s defense made getting back into the game feel like trying to scale Mount Everest. Annabelle Bergey shined in defeat for Muncy, going 2 for 2 with a walk, an RBI and a run. Bergey’s one-out RBI single in the sixth inning, pulled Muncy within 10-2. She is having an outstanding senior season, providing both production and leadership for a young team that starts mostly underclassmen. A year after striking out just twice, Bergey is hitting .556 and has four hits over her last two games. The four-year starter has increased her average in each of the last three seasons and appears poised for her best year yet. Montgomery closed the game strong, scoring three seventh-inning runs. Persing, another talented freshman, belted an RBI single and Snyder followed with a sacrifice fly. Breanna Segraves (1 for 3) and Kylie Persing also scored that inning before Snyder closed out the win by retiring the side in order. Emily Snyder and Shelby McRae. Rory Oden and Alexis Treese. W: Snyder, (3-2). L: Oden, (2-3). Top Montgomery hitters: Faith Persing 2-4, 2B, RBI, 2 runs; Morgan Tupper 2-2, 2 BBs, 3 runs, 2 SBs; Riley Fry 2-4, HR, 3 RBIs, 2 runs; Brynn McRae 2-5, RBI, run; Breanna Segraves 1-3, 2 runs. Top Muncy hitters: Annabelle Bergey 2-2, BB, RBI, run; Oden 1-2, run; Nicki Johnson 1-3. Records: Montgomery (3-2, 3-1 Mid-Penn), Muncy (2-3, 2-1).